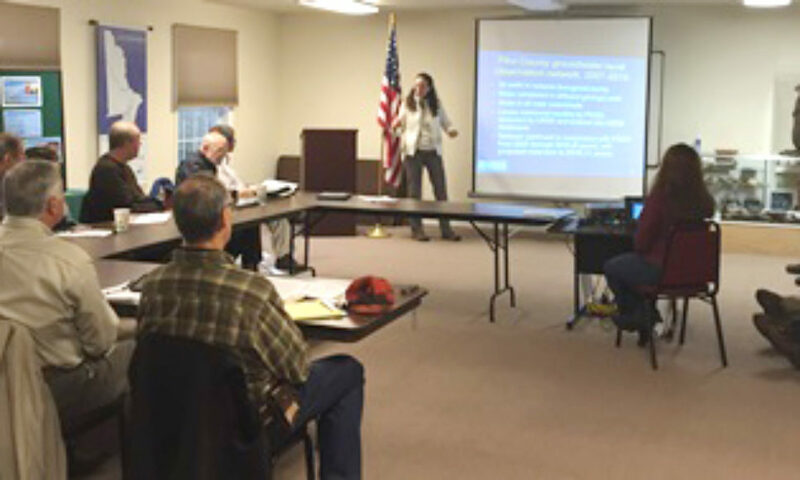 Lisa Senior, Senior Hydrologist with US Geological Survey (USGS) provided the Conservation District Board and Members of Pike County Scenic Rural Character Preservation Program Board with an update on the PCCD/USGS ongoing groundwater well level study in Pike County at the October 19, 2015 PCCD Board meeting. 2015 marked the eighth year of this cooperative effort between USGS and the Pike County Conservation District (PCCD). The Pike County Scenic Rural Character Preservation Program has supported this effort through grants since the beginning of the study in 2007. The study involves regular monthly monitoring of 24 groundwater wells located in a network throughout Pike County. Wells are located in all of the major watersheds and in different geologic types. The study monitors annual and seasonal ranges of water level fluctuations. The long-term data of the study can be used for establishing and monitoring drought conditions. The study is also useful in determining water budgets for watersheds and establishing stream base-flow conditions. PCCD and USGS have submitted a proposal to continue this study through 2018. This extension of the work would result in a total of 11 years of collected data which would then provide additional significant information for drought triggers and other critical groundwater resource planning.